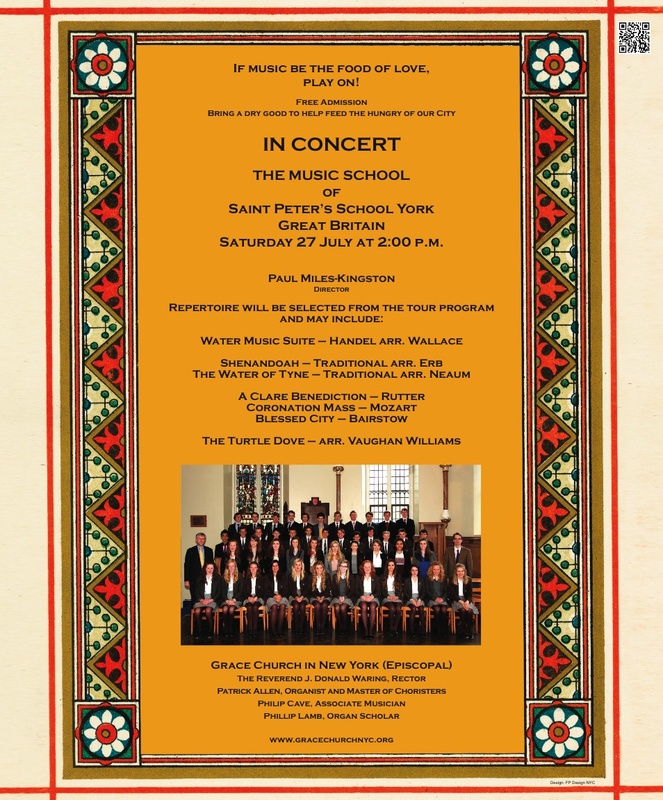 IN CONCERT at Grace Church, Saturday 27 July at 2:00 p.m.
Students from The Music School of Saint Peter’s School York, Great Britain under the direction of Paul Miles-Kingston. St Peter’s School was founded in AD627 by St Paulinus at the same time as he built the first church on the site of York Minster, the largest Gothic cathedral in northern Europe, making the school the fourth oldest in the world. Famous former Headmasters include St John of Beverley, Archbishop Aelberht and Alcuin of Northumbria. Perhaps the most famous Old Peterite is Guy Fawkes, whose name is synonymous with the Gunpowder Plot, which has been commemorated in England since 5 November 1605. The Music School at St Peter’s, director Paul Miles-Kingston, is staffed by over 30 teachers. It offers many opportunities for pupils to take part in choirs, orchestras, bands, chamber groups and ensembles. St Peter’s has a strong Christian foundation and, in addition to services and concerts in the beautiful School Chapel, pupils regularly participate in public events in York Minster, which is just a short walk away from the school. Regular tours abroad are undertaken, and the Chapel Choir has recently sung Evensong services at Trinity College, Cambridge, and at St Paul’s Cathedral, London. St Peter’s School has three choirs: a large School Choir of 150 singers; the Chapel Choir of 50; and the Chamber Choir of 20. The chapel choir is a liturgical choir, singing regular evensong services both inside school and at various cathedrals each year, as well as our annual Carol and Commemoration services in York Minster. The choir is a traditional collegiate shape, with full SATB on both sides, allowing for double choir repertoire. 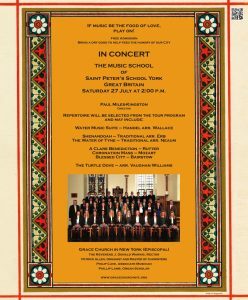 The choirs tackle a challenging programme; a highlight last year was a performance of the Ellington Sacred Works with Stan Tracey’s Orchestra in York Minster. There is a long tradition of brass playing within the school and the Brass Ensemble is at the centre of all the most important and prestigious events that take place within the academic year. The ensemble regularly plays for the School Carol Service and Commemoration Service in York Minster leading the congregation and accompanying the choir. In 1995 the ensemble was invited to appear in the film Fairytale, the story of three Victorian sisters who took photographs of fairies at the bottom of their garden. Members of the ensemble are chosen from the main school Wind Band and the instrumentation varies from a quartet to a tentet, giving the ensemble a large and varied repertoire ranging from the Renaissance to Modern, Classical to Pop and many original compositions. Paul Miles-Kingston began his musical training as a chorister at Winchester Cathedral. As Head Chorister, he was chosen to be the treble soloist on Andrew Lloyd Webber’s Requiem album, which went platinum and won a Grammy award. The world première performance took place at St Thomas, 5th Avenue, New York City in 1985. Paul appeared in many television and radio broadcasts, including a Royal Variety performance, and made a solo album recording for EMI. Paul continued his education at Cranleigh School in Surrey, where he was a Music Scholar. He then went up to Durham University, where he was a Bass Choral Scholar at the Cathedral, graduating in music and achieving a first in his finals recital as an organist. At the start of his professional career, Paul pursued an active career as a Bass, working for eight years as an oratorio soloist and consort singer. During this period, he was contracted as a Songman at York Minster and later as a Bass Lay Clerk at Christ Church, Oxford. Paul has sung with many other consort groups including the Scottish Early Music Consort, Voces Sacrae and The Clerks of Christ Church. Paul was awarded an LRSM diploma in singing teaching in 2000 and he was vocal trainer to the boy choristers at Christ Church from 2004-2006. He has recently completed an MA (by research) at York University examining the training of boys’ voices. As a Director, Paul has broad experience of directing both professional and student vocal and instrumental ensembles. He was appointed Director of Music at Christ Church Cathedral School, Oxford in 2002, a post he held until he took up the position of Assistant Director of Music at St Peter’s School, York in September 2006. He was appointed as Director of Music at St Peter’s in September 2010.